Saddle Up, Cowpokes: It’s High Time For The Little Boots Rodeo (And Svengoolie)! The Daves would like to welcome back guest blogger Jamie Lee Cortese! We always appreciate her contributions to this site! Community events, in my experience, can offer up a surprising amount of fun. The annual Little Boots Rodeo in Elk Grove Village is no exception. Like the previous year, this year’s Rodeo was two days (Saturday, June 23, and Sunday, June 24). To the extent of my knowledge, the various offerings at the event were the same both days. Among the returning attractions was a pair of mechanical bulls. These particular bucking bulls are designed for, as the event’s moniker suggests, the “little boots” moseying around the Rodeo. Although anyone can saddle up and try his or her luck, as a general rule, if you find yourself sitting down on the bull rather than hoisting yourself up onto it, then don’t expect to go tumbling to the inflated terrain below except of your own accord. For the junior cowpokes, however, it offers a fun opportunity for them to brush up on their bull taming skills without their parents worrying about their safety. No, he won’t try to buck you off of his back, and there weren’t any camels back in the Wild West, but hey, the Rodeo gets points for creativity! As in previous years, there were actually two sources of music (country music, of course): on one end of the grounds, there was a stage set up with a sound system, from which recorded songs played. On the other end, a duo of musical cowboys performed live. Ironically, at one point, “The Dream Camper Music Show” treated Rodeo attendees to the country tune, “Elvira”! Also returning for the Rodeo fun were the duck and pig races (which were actually separate events held on either side of the grounds). 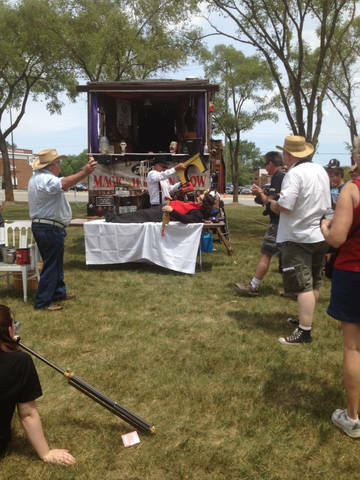 Which brings us to two more grand Little Boots Rodeo traditions: a visit from Svengoolie, and an epic showdown between Sven and Mayor Johnson of Elk Grove Village! For their first duel, in 2010, they went head-to-head on the aforementioned mechanical bulls, and, after much deliberation, it was decided that the mayor was the victor. The following year, their rematch took the form of a duck race; this time, Svengoolie came out victorious! With the official score now tied, it was time for a final, tiebreaking battle between the two. The decisive duel would take the form of…a pig race! After the official arrival of the two rivals, the man running the pig races drummed up enthusiasm from the sizable crowd around the track for each of them…or, at least, he tried to. He asked people to cheer if they wanted the mayor to win, and…a few people half-heartedly voiced their support. Mayor Johnson may have had the people’s votes for political office, but when it came to pig races, their hearts were with Sven. (I feel like there’s probably a joke in there somewhere, but I won’t be the one to make it.) After some amusing banter from the announcer, Mayor Johnson, and Svengoolie, the pigs were brought out! Although the announcer claimed that Sven’s assigned pig (named “P90X”) was the result of genetic experiments, it would seem that those experiments backfired, as the porcine racer was about a quarter of the size of the competitor assigned to the mayor (named “Ol’ Faithful”)! Ol’ Faithful and P90X must have been extremely eager to race, because they actually had a false start, and had to be coaxed back behind the starting gate. There was a little hiccup, though: both pigs ended up in the same pen––– and P90X facing backward! 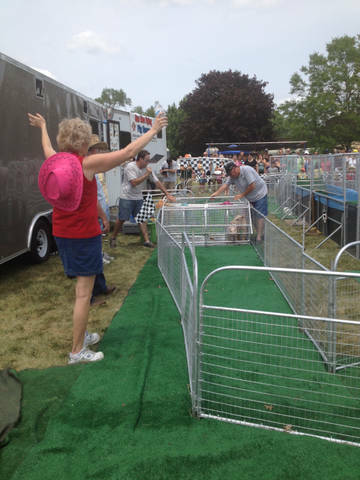 Then, at last, it was time to lift the starting gate and let the pigs fly across the track! 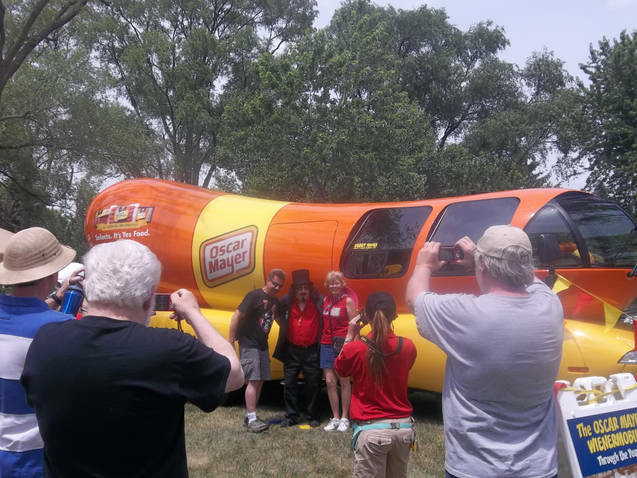 Can you just picture a little cartoon car singing, “Oh, I wish I were an Oscar Mayer Weiner…mobile”? The famed Weinermobile was there the entire weekend, and anyone could pose for a picture with it! One of the two drivers would even take a picture of you for free and e-mail it to you as a postcard! And now we know why it was free. As soon as Mr. D. started, Sven cried out––– “I had left my iron on at home!” He stayed, though, and braved the blade! Oh no! Will Sven make it?! Sure enough, as the saw finished its trek across the track (and Sven), it was revealed that Mr. Goolie was alive and unharmed! Hooray! Now he was free to go meet and greet, sign autographs for, and take pictures with fans! Well, almost. 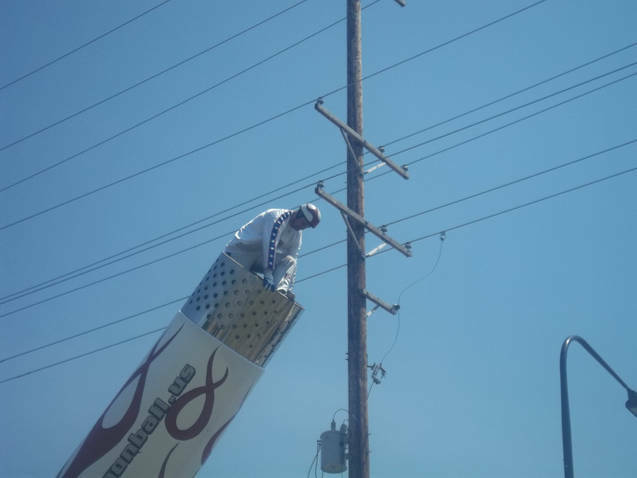 After meeting, greeting, signing, and taking pictures for a while, Sven took a little break to watch a new attraction the Rodeo lassoed in this year––– Dave Smith, Jr., the human cannonball! 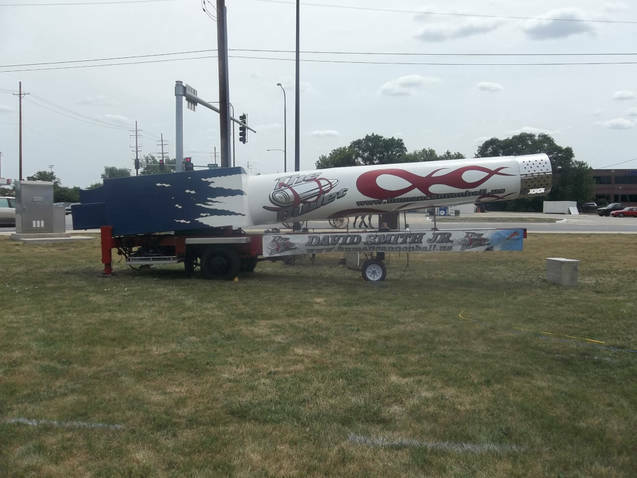 This cannon was built by Dave Smith, Jr.’s father (also a human cannonball) with the specific purpose of shooting human cannonballs as high and as far as possible. 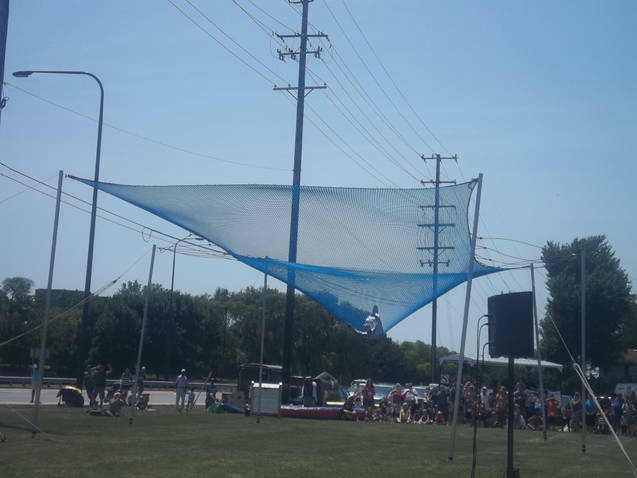 Dave Smith, Jr. also told the crowd that his father once held the world record for the longest distance traveled by a human cannonball, and, ever since, “that record has never left the family.” The crowd looked on as Mr. Smith proceeded to check the blue netting on which he planned on landing, to make sure it was neither too loose (which could cause him to hit the ground) nor too tight (which could cause him to bounce right off of it and hit the ground). Satisfied with what he observed, he returned to the cannon, and stood on it as it was raised into the air. Once the cannon was at the target angle, Mr. Smith donned his helmet, and climbed inside. Dave Smith, Jr. prepares for takeoff! We had been instructed to count down from ten once he was ready. We did so, and…nothing. Apparently, some eager people had initiated the countdown too early. At last, though, Mr. Smith told us he was ready, and we gladly began again…this time, he was blasted into the air! With that, it was time to return to the ever-growing line to meet Sven as he resumed greeting fans and beating the heat. I’ve written it before, and I’ll write it again: when attending a Svengoolie appearance, it is well worth it to make the effort to talk to the people around you in line. (If nothing else, it’ll help pass the time, but I digress.) This time, the groups on either side of me were both meeting Svengoolie for the very first time. A woman from the family behind me wondered aloud if Svengoolie would charge for autographs, and a man waiting in front of me smugly commented that nothing’s free. (Perhaps he missed the memo that getting into the Little Boots Rodeo was free, although it was requested that everyone bring a canned food item to donate to the local food pantries.) Many people, upon waiting in line to meet Sven for the first time, find themselves asking the same question. In light of this, I will write here what I told them: autographs from and pictures with Svengoolie are always free––– and yes, he does bring autograph cards, but will also gladly sign items brought by fans. Two elements that were present two years ago, but, thankfully, skipped town last year, unfortunately found their way back to the Rodeo this year: the heat and the humidity. “How hot was it?” It was so hot, that despite being given water constantly, even the camel was panting (Apparently, camels can pant. 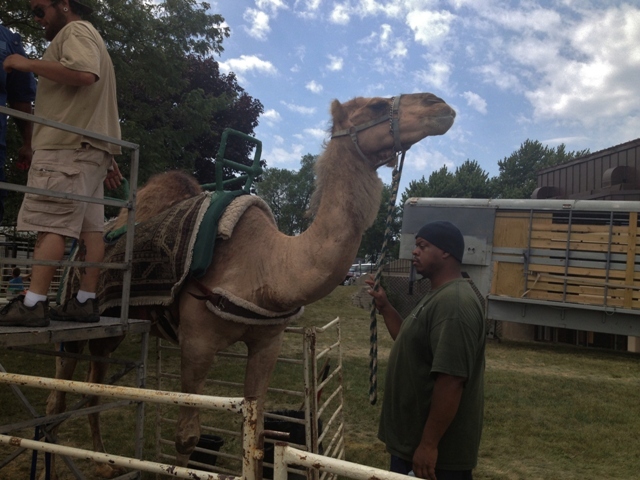 ), and the hump actually appeared to be “flopping” at times! Yikes! 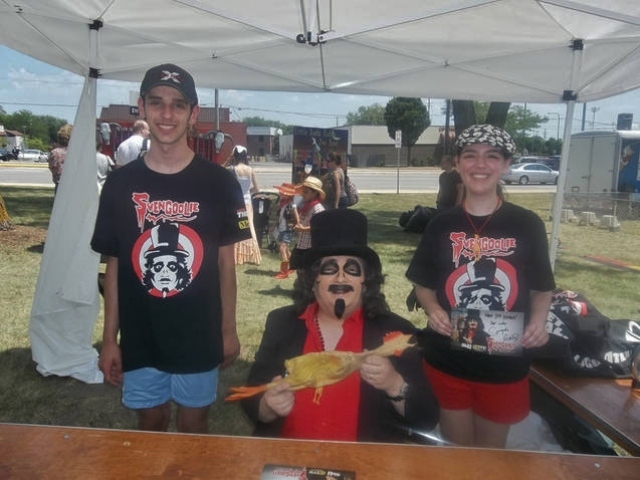 However, neither snow nor rain nor heat nor any other type of strange Chicagoland weather will keep Svengoolie from meeting his fans at an appearance, nor will it dampen his spirits. 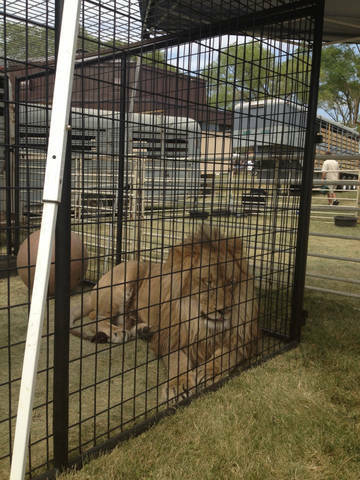 The Rodeo did provide Sven with a fan (the electric kind) to keep him cool, but still, it could only accomplish so much. Kudos to Mr. Goolie for sticking it out both days and being as nice as ever to your fans! 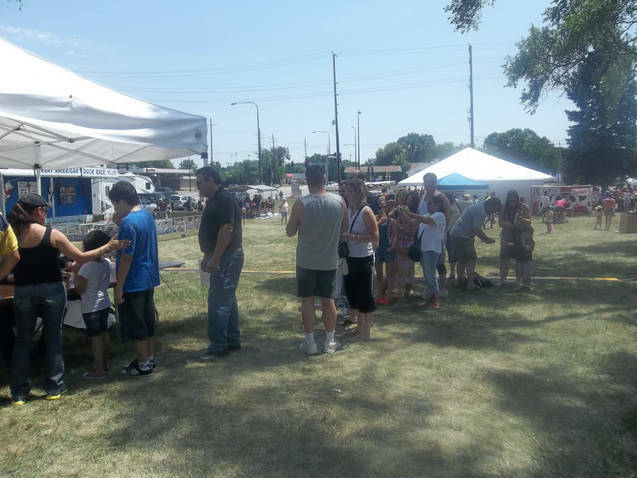 And there were a lot of fans who came out to see him, despite the heat! Including my family, of course! 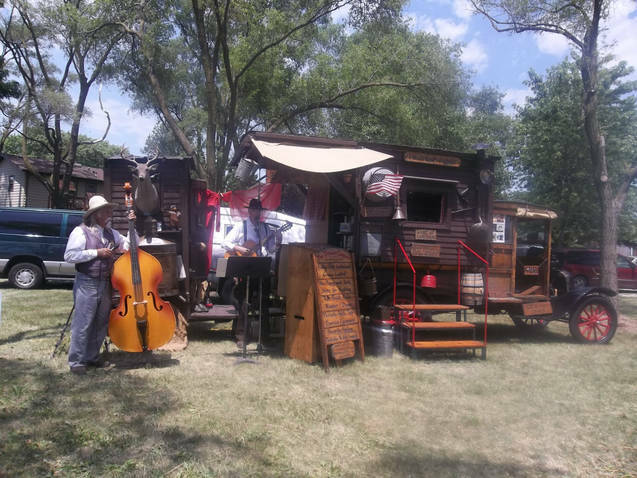 This was the fifth year that the Little Boots Rodeo rode into Elk Grove Village, and it was the third year running that Svengoolie moseyed into the event. Not quite coincidentally, it was my family’s third visit, as well; and, if next year’s Little Boots Rodeo is anything like this year’s, it won’t be our last. 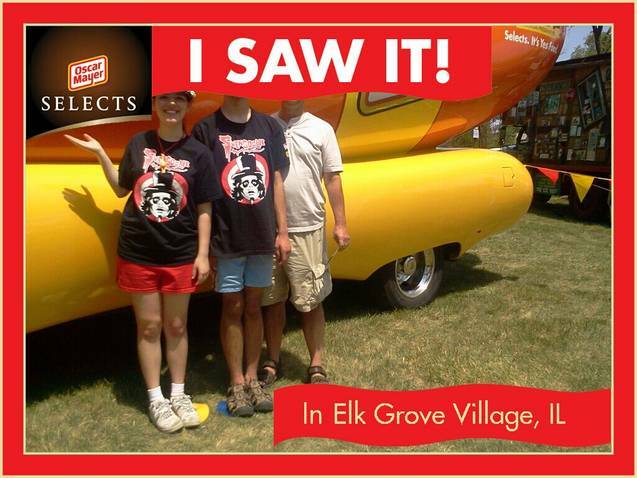 This entry was posted in Horror Hosts and tagged Elk Grove Village, Svengoolie, The Little Boots Rodeo. Bookmark the permalink. ← G-FEST XIX Monster Costume Parade: Godzilla Fans Stomp the Catwalk!